The LDP63100 series has been discontinued. Please see the ILD-UTP Series as a possible alternative or contact our sales department. The LDP63100 Series is a versatile display that can increase productivity by offering the plant floor or production area a large visual display of their current status. Whether your measurement needs are for temperature, voltage, current or process information, the LDP63100 can satisfy your requirements. The LDP63100 accepts various analog inputs which allow the unit to adapt to most any application. Additional plug-in option cards add alarms, analog outputs, and communication/ bus capabilities, making the LDP63100 an “intelligent” panel meter. 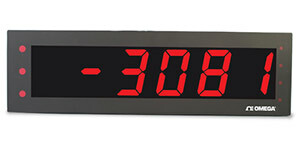 The unit has a large display, designed to be remotely mounted, therefore the unit does not have a programming keypad. Unit programming can be accomplished through the use of external switches that can be wired via the terminal block; a minimum of 3 switches is required. An optional programming remote option provides a 10' interconnecting cable and programming box. The remote buttons make programming the display easy.